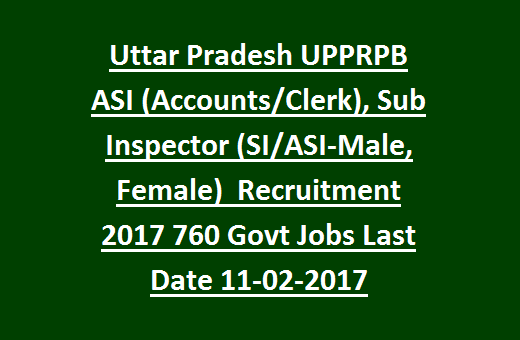 Police Recruitment Promotions Board UP (SI) Sub Inspector, ASI Jobs 2017: UPPRPB Uttar Pradesh Police Recruitment Promotions Board invites online applications from the qualified candidates of Uttar Pradesh state to recruitment the available 760 Govt Jobs in UP Police Department SI, ASI Jobs of Clerk, Accounts and Gopaniya Cadre. For Female SI 34 vacancies, for Male Sub Inspector 136 vacancies and for ASI Male (Accounts, Clerk) 473 vacancies, For Female ASI (Accounts, Clerk) 117 Jobs available in Uttar Pradesh Police Department Accounts, Gopaniya and Clerks Services. 2 separate notifications released for the recruitment of Sub Inspector/ASI (Male, Female) Jobs. Selection for this Sub Inspector and Assistant ST Jobs recruitment of UPPRPB will be conducted in 5 different stages of Online written exam, Physical Standard Tests, Physical Efficiency Tests, Computer Typing or Stenograph Test, Final Merit List and Medical Examination. For more information regarding this SI and ASI Jobs of Uttar Pradesh Police PRPB Recruitment 2017 Vacancies see the below given information. Sufficient Qualifications having candidates can apply online from 12-January-2017 to 11-February-2017 through PRPB UP Police website @prpb.gov.in. Online applications only accepted by PRPB Uttar Pradesh for the recruitment of Sub Inspectors and Assistant SI of Accounts, Clerk and Gopnaiya Services. There are total 760 vacancies available in this latest recruitment of SI and ASI Jobs in UP Police Recruitment Promotions Board of Uttar Pradesh State. Should have completed any Bachelors Degree from a recognized university. Minimum 25 WPM Typing Speed in Hindi (In script Board-Unicode) and 30 wpm in English typing is mandatory. 80 words per minute in Shorthand Dictation in Hindi Typing is required. For Police Assistant ASI (Accounts/Clerk)-DOEACC or NIELIT Certificate of "O" level is required. At least 2 years experience in Territorial Army. For both the posts of ASI, Sub Inspector posts application fee is Rs.400/- candidates can pay the fee through online using Credit Card/Debit/Internet Banking or can pay the fee through E Chalan. Selection for this PRPB recruitment of UP Police Govt jobs of ASI and Sub Inspectors will be held in 5 different stages. 5. Final Merit List and Medical Examination. Examination will be conducted for 400 marks. Test will be conducted in the form of Objective type multiple choice questions with four different sections. Applications will be received through online portal of PRPB Uttar Pradesh @prpb.gov.in. Final submission after fee payment is 18-02-2017. 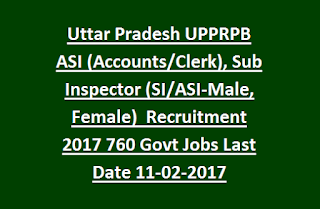 Click here to apply online for UPPRPB Sub Inspector and ASI Jobs.